22 APRIL - 3 MAY 2019 United Nations Headquarters, New York. Catch PART II - Robby Romero LIVE on ”Beyond the 7th Fire” Radio Kingston WKNY 1490am Sunday, April 14, 12pm EST. On the Anniversary of Standing Rock, Native Children’s Survival presents the VEVO premiere of BORN ON THE REZ. The music picture, feat. Ojibwa Warrior Dennis Banks and Country Outlaw Kris Kristofferson, was written, produced and directed by Robby Romero, and will screen April 1, 2019, at 12pm. ROBBY ROMERO RED THUNDER 25TH ANNIVERSARY DROPS TODAY! In commemoration of the famous 71-day occupation of Wounded Knee, Eagle Thunder Records presents the 25th Anniversary of Robby Romero’s groundbreaking and critically acclaimed EP RED THUNDER — spotlighting the new track, BORN ON THE REZ featuring American Indian Movement leader, Dennis Banks (1937-2017). The corporate state threatens to use the Royal Canadian Mounted Police, a federal and national police force of Canada, against Indigenous Peoples at Unist’ot’en Camp in northern “BC, Canada”. This year marks the 50th Anniversary of the American Indian Movement (AIM). To understand the rise of the American Indian Movement, one must first distinguish the discrepancies between truth and myth, actuality and propaganda, history and his-story. As the second week of the United Nations Climate Change Conference gets underway, worldwide carbon emissions reach a new record high. 7 December 2018 is Indigenous Peoples’ Day at COP24 in Katowice, Poland. The day celebrates Indigenous Peoples and Organizations with official side events and activities during the 24th Conference of the Parties to the United Nations Framework Convention on Climate Change. The 24th Conference of the Parties to the United Nations Framework Convention on Climate Change will be held 2 - 14 December 2018 in Katowice, Poland. Join us Thursday, 29 November 2018, 5PM at the George Pearl Auditorium, UNM campus, Albuquerque, New Mexico for the screening of BORN ON THE REZ & WARRIOR WOMEN. Robby Romero live and in the house on WMOT Roots Radio with host Whit Hubner at the Nashville Palace in Music City. Roots Radio is a live broadcast on WMOT 89.5FM. You can listen online at WMOT.org or on the RootsRadio app. With honor and respect for Indigenous Peoples’ rights and cultures, this NATIVE AMERICAN HERITAGE MONTH (November 2018) Eagle Thunder Records presents the 25th Anniversary of Robby Romero’s groundbreaking and critically acclaimed EP RED THUNDER — spotlighting the new track, BORN ON THE REZ produced by four time Grammy Award winning musician, record producer, and record executive, DON WAS. Together we have #PeoplesPower — Join NATIVE CHILDREN’S SURVIVAL in challenging the US Congress to #RightTheWrong and honor at least one of the more than 500 broken treaties made with Native Nations. This Native American Heritage Month, KXCI 91.3 FM Global Express featured album of the week, ROBBY ROMERO | RED THUNDER 25th ANNIVERSARY. KXCI will be featuring Robby’s critically-acclaimed EP with a different song playing each day. Robby Romero live with Luke on KDNK 88.1 FM Carbondale/Aspen, Colorado on 14 November at 3pm. Robby will be talking with Luke about Native Children’s Survival’s #Honor1851Treaty petition on MoveOn.org, the campaign behind the song BORN ON THE REZ, and his 25th ANNIVERSARY release, RED THUNDER. Robby Romero will be live on KVNF 90.9 FM Mountain Grown Community Radio in Paonia, Colorado at 3pm MST. Get the latest on Robby’s new single BORN ON THE REZ, his 25th Anniversary EP release, and Native Children’s Survival’s, #Honor1851Treaty petition campaign. On 6 November 2018 Robby Romero will be live on KSUT 91.3 FM in Ignacio, Colorado at 9:30 AM. 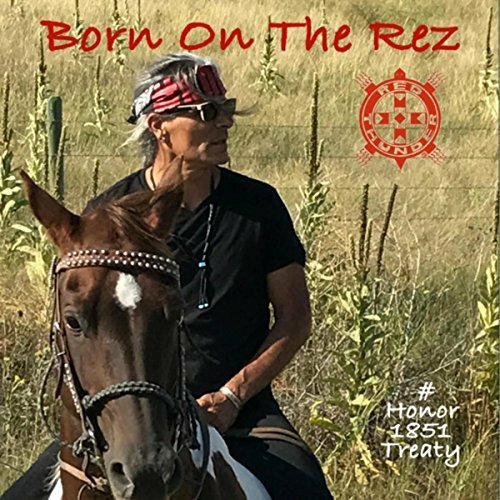 Tune in to hear the inside scoop about Robby’s new single BORN ON THE REZ, Native Children’s Survival’s #Honor1851Treaty campaign, and the RED THUNDER 25th ANNIVERSARY release. The United States of America proclaimed November as Native American Heritage Month. Join us in challenging the US Congress to #RightTheWrong and honor at least one of the more than 500 broken treaties made with Native Nations. Dakota Romero’s beautifully haunting debut of the culturally iconic song LA LLORONA (Weeping Woman) was released 1 November 2013 in celebration of the Day of the Dead (Día de los Muertos). Dakota’s LA LLORONA music picture has received more than a quarter of a million views and climbing. Her performance is dedicated to the memory and spirit of her Grandmother. Robby Romero’s new music picture, featuring the Great Ojibwa Warrior Dennis Banks and the legendary Kris Kristofferson, will screen at UCLA’s Indigenous Peoples Day Celebration hosted by the American Indian Studies Program in Los Angeles, California. Bonnie Raitt joins Robby Romero on Robby’s classic Prayer Song October 10, 1992 at the Shoreline Amphitheater, Mountain View, Ca. Twenty-five years ago, when Bay Area Indian Alliance convinced the city council of Berkeley, California to declare 12 October a “Day of Solidarity with Indigenous Peoples”, Berkeley became the first city in the United States to replace Columbus Day with Indigenous Peoples’ Day, setting a precedent for other cities and states to follow. The Oceti Sakowin Homelands Screening of WARRIOR WOMEN featuring the debut of Robby Romero’s long-form music picture BORN ON THE REZ will be held on 23 September at the Dahl Arts Center in Rapid City, South Dakota at 1:30pm with a reception to follow. In honor of the Fort Laramie Treaty, signed on 17 September 1851, Robby Romero will visit with DJ Charles New Holy on KILI Radio 90.1 FM, the Voice of the Lakota Nation, on the Pine Ridge Indian Reservation at 5pm MST. In honor of the Fort Laramie Treaty signed on 17 September 1851, between United States treaty commissioners and representatives of the Cheyenne, Sioux, Arapaho, Crow, Assiniboine, Mandan, Hidatsa, and Arikara Nations, the new single BORN ON THE REZ commemorates the 25TH ANNIVERSARY release of Robby Romero’s groundbreaking and critically acclaimed EP RED THUNDER. Pre-Orders for the 25TH ANNIVERSARY will be available during NATIVE AMERICAN HERITAGE MONTH (November 2018). Join Native Children’s Survival and our sisters and brothers at the Arizona to Rally Against Native Mascots on Sunday, 9 September 2018 / 10:00 am to 1:30 pm at the University of Phoenix Stadium. "The term 'redskin' is a dictionary-defined racial slur rooted in the attempted genocide of Indigenous Peoples." Join Native Children's Survival and our sisters and brothers this weekend at the Rise For Climate rallies in hundreds of cities and towns around the world to fight climate change, demand an end to fossil foolishness for profits for the 1%, and a commitment to building a fossil free sustainable future for our children and the generations to come.